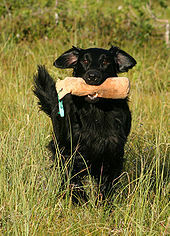 This bred developed from crossing such breeds as Newfoundlands, sheepdogs, spaniels, water dogs and various setters. On first looking at you, one may think that this breed resembles the Golden Retriever, however it is a distinctive breed which was developed as a dual-purpose gun dog, to go after game, both on land and water. It is affectionately called a Flattie. It is an intelligent breed and gets on well with other dogs and also children. It is a working dog, so does need a lot of daily exercise so that it does not get bored and frustrated, which could result in behaviour problems. Eager and quick to learn, they are best trained in short intervals, as they may bore with repetition. Bearing in mind that the British Kennel Club recommends that this breed needs about 2 hours a day, it is not for everybody! They are intelligent and love to learn, however due to their intelligence, they get very bored if you keep on repeating the same exercises, and do better with very short training sessions throughout the day. They do not cope well with being alone, and are prone to separation anxiety. This can result in the barking and being totally destructive. To avoid this, training for Alone Time should start as a pup and be continued throughout their lives. They mature much later in life (about 3 - 5 years), so you will have a puppy like dog, with all the puppy excitement and exuberance that goes with it! They do tend to be rather 'mouthy' and this should be trained out of them when pups. They also tend to pick up things and take off with them, so training the Swap, Leave and Real Reliable Recall is a good idea. On average the Flat Coated Retriever does not tend to be aggressive to other dogs, however you must make sure that your dog has been well socialized so that it will accept another dog into the home. 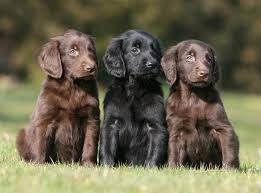 ​On average they do, however this is very dependent on good breeding and early socialization from being a pup. It should never be assumed that a particular breed is a social butterfly! ​With early socialiazation they can get on with small animals, however they should be supervised as they are a hunting dog and prey instinct is strong. eAre they good with children? On average they do extremely will with kids and nothing will make this breed happier than having somebody to throw a ball or a frisbee - for sure it will be the child that tires first! They are very bouncy and energetic dogs, so care must be taken with small children so that they do not get bowled over. By the same token, children must be taught how to interact with dogs and to respect them. Breed health concerns may include cancer, hip dysplasia and elbow dysplasia, entropion, distichiasis, micropapilla, glaucoma and progressive retinal atrophy. Hemangiosarcoma, fibrosarcoma, osteosarcoma and malignant histiocytosis are particularly troublesome and seem to occur at higher rates in Flat-Coated Retrievers than in many other breeds. Do train Alone Time exercises so that separation anxiety does not develop. As these dogs tend to be 'mouthy' in general, good idea to teach the Leave, Swap and Real Reliable recall for when the dogs dashes off with an object in its mouth. Do be aware that you will have a 'puppy like' dog for at least 3 - 5 years.